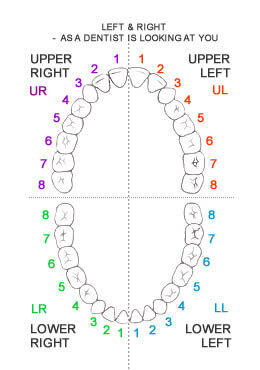 For example, UR1 is the upper right central incisor, and LL8 is the lower left wisdom tooth. 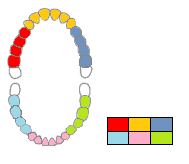 Each section is given a score, based on the least good finding in that section. To do this, a perio probe (a special gum millimetre ruler) is “walked around” below the gumline. The force used while doing this is so light that you may not even notice it and thus wonder how your dentist or hygienist comes up with the numbers. 3 = the probe goes a little further under the gum than it should. This is a sign of early gum disease. Don’t panic as this can readily be treated! In the US and Canada, the numbers refer to the periodontal pocket depth readings. Normal, healthy pocket depths are usually 3 mm or less. 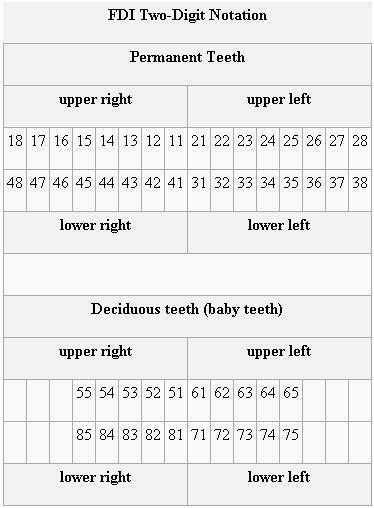 Numbers may be read out in groups of three, which indicate readings taken from different areas of the teeth. To get an idea of what the different pocket depths mean, see above.